PC Antispyware 2010 is a fake security software (rogue) from the Braviax family: Home Antivirus 2010, PC Security 2009, Home Antivirus 2009. The rogue creates fake files on the system and detects it as malware to scare users. But its database is from ClamAV and its date is 09 Dec 2007 (a bit outdated). 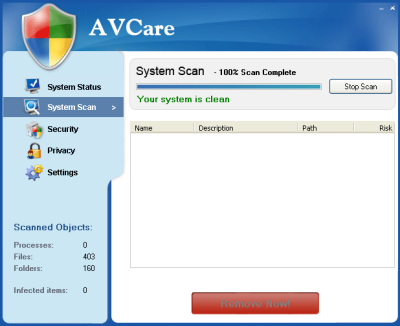 AVCare is a fake AntiMalware software. It detects fake infections and displays fake alerts messages to scare users. 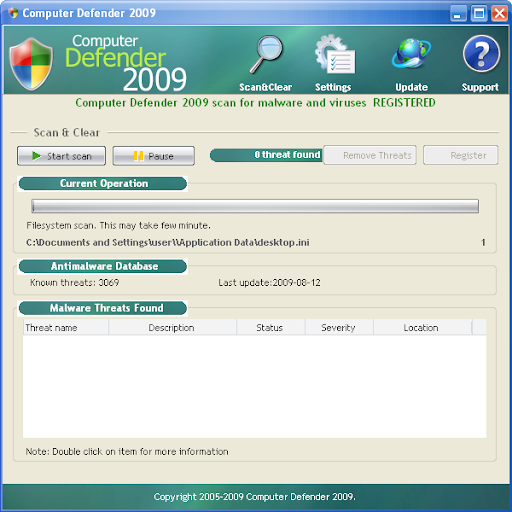 Computer Defender 2009 is a new rogue from the same family as Antispy Protector 2009, SmartDefender Pro, Virus Remover Pro, Extra Antivirus, AV Antispyware, PAntispyware09, MS Antispyware 2009, Pro Antispyware 2009, SysAntivirus 2009, WinSpywareProtect. 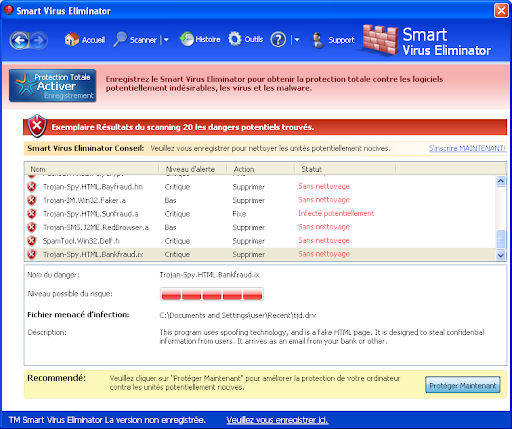 Smart Virus Eliminator is a new rogue from the same family as Windows Protection Suite, Windows System Suite, Windows Security Suite, Malware Destructor 2009, FastAntivirus, MalwareCatcher, VirusShield, Extra Antivirus, Virus Sweeper, Ultra Antivir 2009, Virusdoctor, VirusMelt, VirusAlarm. 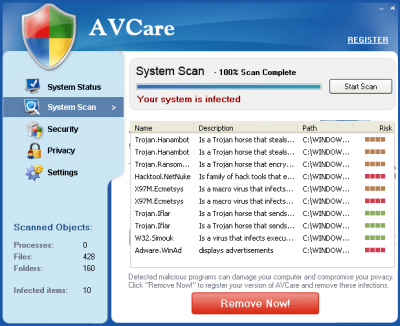 Smart Virus Eliminator displays fake alerts to scare users. 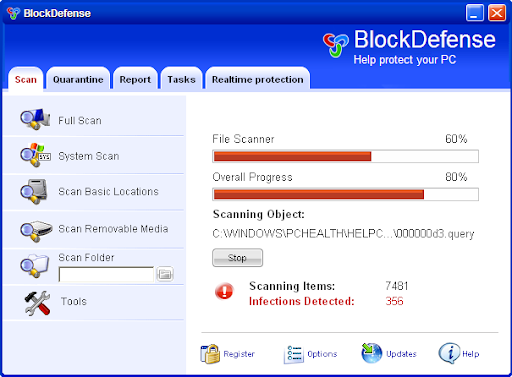 BleepingComputer Smart Virus Eliminator removal guide. 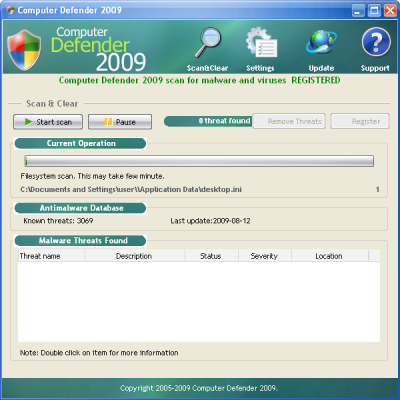 Total security 2009 is a new version of System Security rogue. This fake anti-spyware tool displays fake alert messages, prevent execution of legit programs, detects inexistent infections to scare users. Registering the software before the 1st scan begins, the tool detects no infections. Then, clicking on Updates button, the tool shows an "Updating" ballon message, but there is no network activity. Windows Protection Suite Rogue is the new version of a long family list: Windows System Suite, Windows Security Suite, Malware Destructor 2009, FastAntivirus, MalwareCatcher, VirusShield, Extra Antivirus, Virus Sweeper, Ultra Antivir 2009, Virusdoctor, VirusMelt, VirusAlarm. Windows Protection Suite comes from fake online scanners and detects nonexistent malwares to scare users pushing them to buy a license. AV Antispyware, PAntispyware09, MS Antispyware 2009, Pro Antispyware 2009, SysAntivirus 2009, WinSpywareProtect.